Zurich, Switzerland, March 19, 2014 - ABB, the leading power and automation technology group, has won an order worth around $110 million from the Saudi Electricity Company (SEC), Saudi Arabia's national power transmission and distribution operator, to construct substations that will help boost transmission capacity in the country's western region. The new substations will link the Taif East Governorate, a part of the Mecca region, to the national 380 kilovolt (kV) transmission grid. The 110 kV power supply enabled by the substations will serve the settlements of Turbah, Al-Khurmah and Rania, mitigating the use of diesel-generated power in isolated areas. "We are privileged to continue supporting the development of Saudi Arabia's power infrastructure," said Claudio Facchin, head of ABB's Power Systems division. "These substations will strengthen the grid and enhance transmission capacity, bringing much-needed electricity to the region to meet growing domestic and industrial demand." The turnkey order includes design, supply, installation and commissioning of a 380/110 kV bulk supply point substation and the expansion of the existing remote-end substations in Bisha and Sised to support the 380 kV grid interconnection. ABB's gas-insulated switchgear (GIS) and hybrid technologies will ensure reliability and efficiency while minimizing environmental footprint. Other key product supplies include control and protection equipment, auxiliary systems and substation automation equipment compliant with the international IEC61850 standard to enable monitoring and control of the substations from a remote control center. 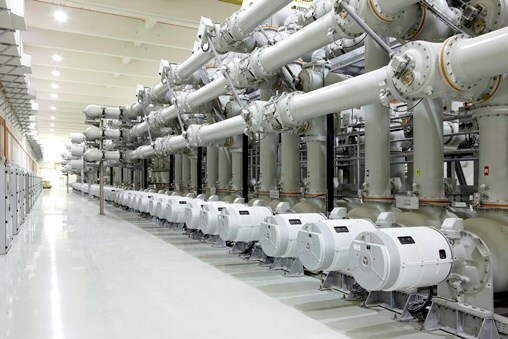 ABB is the world's leading supplier of turnkey air-insulated, gas-insulated and hybrid substations with voltage levels up to 1,100 kilovolts. These substations facilitate the efficient and reliable transmission and distribution of electricity with minimum environmental impact, serving utility, industry and commercial customers as well as sectors like railways, urban transportation and renewables.